"Google Maps of the 17th century"
It is a first edition from 1662 and contains a total of eleven volumes. These contain 592 hand-painted maps - plus over 3,000 pages with descriptions of the continents, regions and countries shown. 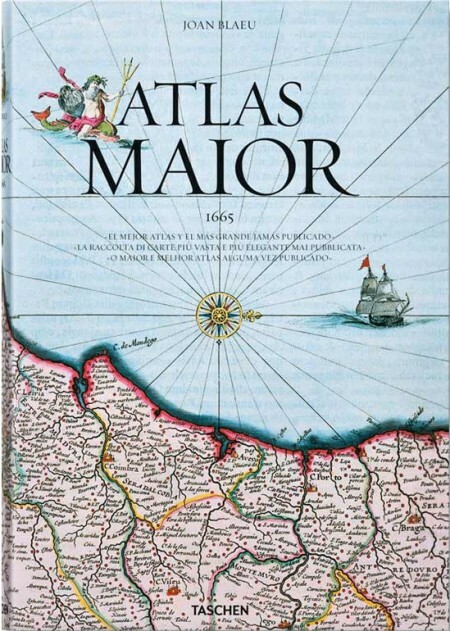 The atlas was considered the most expensive book of its time. The value of the issue offered by a private collector is estimated at 250,000 to 350,000 euros. According to Aarenberg, only twelve editions are known in public collections worldwide. Working for the Dutch East India Company, Joan Blaeu produced a vast atlas with hundreds of baroque maps gracing thousands of pages. "He's the last of a tradition: the single, brilliant, magician-like mapmaker who says, 'I can magically show you the entire world,'" Brotton, a professor of Renaissance studies at Queen Mary University of London says. "By the late 17th century, with joint stock companies mapping every corner of the world, anonymous teams of people are crunching data and producing maps." Blaeu's market-oriented maps weren't cutting-edge. But he did break with a mapmaking tradition dating back to Ptolemy of placing the earth at the center of the universe. At the top of the map, the sun is at the center of personifications of the five known planets at the time—in a nod to Copernicus's theory of the cosmos, even as the earth, divided into two hemispheres, remains at the center of the map, in deference to Ptolemy (Ptolemy is in the upper left, and Copernicus in the upper right). "Blau quietly, cautiously says I think Copernicus is probably right," Brotton says.